JAKARTA - Students Bogor Agricultural University (IPB) re-discover innovations of modern food products ready-named "Mo Mie". These foods are also meant to ensure diversification. What is Mo Mie ? Mo Mie is the "instant noodles" are made from raw cassava starch modified or Modified Cassava Flour (MOCAF) and Tempe flour. Tempe or Tempeh is a traditional soy product originally from Indonesia. It is made by a natural culturing and controlled fermentation process. Selection of cassava as raw material Mo Mie is quite reasonable. Given the cassava crop is one of considerable potential in Indonesia as a source of carbohydrate, whose production is not optimal because it is still considered less economical. Meanwhile, the addition of “Tempe flour” as a food source of protein, because protein content in the noodles is considered quite low. Therefore, Mo Noodles has several advantages compared with other instant noodles, which is due to high protein content and safe to eat. There are three types of products "Mo Mie" offered by the "dry Mo Mie”, Mo Mie Spaghetti, and Mo Mie Sozzilatos. As is known, instant noodles commonly consumed by people are usually made from raw wheat flour. The use of wheat flour in Indonesia is quite high in the manufacture of instant noodles. It was proven that Indonesia as a country both the consumption of instant noodles per year based on the world's largest wheat. Whereas in Indonesia wheat flour is obtained by importing from abroad. "It is therefore necessary to develop a cassava-based new food products to enhance the economic value of cassava as an alternative substitute for flour and food diversification efforts," said Nur Hasanah Laeli, students of the Department of Community Nutrition Faculty of Human Ecology (FEMA) IPB, which conducted the study “Mo Mie, in Jakarta. Laeli along with four colleagues said, that a food product should pay attention to food safety aspects. One is the use of food preservatives should be in accordance with the recommended standard of government. Therefore, instant noodles their research results free of preservatives are dangerous because in the manufacturing process does not use harmful chemicals. "Looking from the aspect of nutrient content and secure, instant noodles really support the food needs of the world community," said Megawati Simanjuntak, Supervisor of this research. Laeli further explained, MOCAF is a product derived from cassava to cassava by fermentation modification principles. 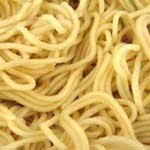 MOCAF contribute little protein so the protein source material needed to boost the protein content in the noodles. One good source of protein and enough potential in Indonesia is Tempe, because Tempe is able to compete with animal protein in terms of quality, quantity and price. Additionally, Tempe is rich in amino acid lysine. Therefore, the addition of Tempe flour as a protein source is expected to improve the nutritional value MOCAF-flour noodle mixture.